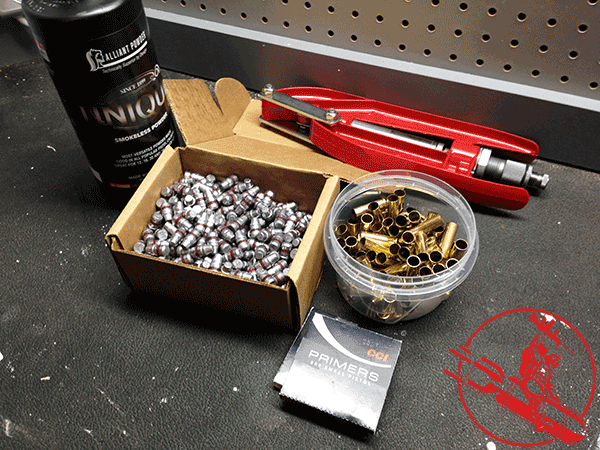 The components of reloading ammunition - powder, bullets, brass and primers. Took son #1 along on a trip for his first time shooting a few days back. I asked, he was pumped to go. He's 5 and a half, so certainly young, and needed some help holding/steadying the rifle (AR with a .22lr conversion). But, with me steadying the rifle, he lined up the red dot and blew up a couple 2L of cheaper than water value brand sodas. It only took him two shots to get on target, too. Not bad! He was happy and proud of himself. So was I. Good times. I also brought along my first batch o' reloads for some informal plinking/target practice. Did not blow myself up, so that's always a good thing. No issues with the ammo at all - no signs of high pressure. Success. I found the lighter handloads much more comfortable to shoot in my Airweight J-frame than factory ammo. With most factory ammo, my hand gets tired and sore after firing off a cylinder or two. I fired through a box worth of reloads without missing a beat. Gaining the ability to better tailor loads to the firearm and to my intended purpose is one of my motivations for getting into reloading. Softer shooting loads for target practice and plinking. Greater accuracy for precision shooting when I get into rifle reloading. That sort of thing. A lot of people get into reloading for the economic benefits - saving money loading their own versus factory ammo. For those unfamiliar with the various component costs, this bares a brief discussion. The biggest component cost in reloading is the bullet. You can go cheap and use lead bullets for around 6 to 9 cents a round for pistol calibers (less if you cast 'em). FMJs or hollow points will be more. Primers are between 2.5 to 3.5 cents each these days. Powder will vary depend on what you're loading. A 9mm or .38 special will eat up 2 or 3 cents worth of powder per round. Brass is pretty much free if you save when you shoot factory ammo and pick stuff up when on the range. Factoring in only component costs, the majority of the ammo I shot ran right around 12 cents a round - or $6 per box of 50. When you figure that the last box of locally purchased .38 special cost me something like $25 for 50 (yup! that sucked), that's 12 cents a round is some pretty dramatic savings. Yes, that's cheaper than you can buy .22lr these days. Now, the true reloading cost would also factor in the depreciation of your equipment, but it's really pretty negligible on a per-round basis. Some people also choose to factor in the cost of their time, but I don't feel that's entirely applicable. If you hate reloading and find it to be a complete and total chore, then maybe. Personally, at least so far, I find reloading to be enjoyable and relaxing. Almost meditative. You get into the the reloading Zen mode and your worries just kind of fade away. Take this evening, for example. I came home from work moderately stressed, annoyed and not particularly happy. Generally in a foul mood. I tried a few different things to put myself in a better frame of mind, but to no avail. Then, I moseyed on over to the reloading bench and primed a hundred cases that I'd previously sized and flared. Used the beat up Lee hand primer that I have. Focused on that task - probably not more than 5 or 6 minutes from start to finish. Then cleaned up and put stuff away. I walked away from the bench with my mind clear, much happier and a much better person to be around. Reloading has also proven to be good bonding time with my boys. They like being with me in the garage, seeing what I'm doing and helping out when they can. They LOVE the tumbler and helping clean brass. My 1.5 year old will follow me out to the garage, grab a container with dirty brass in it and carry it over to the tumbler, dancing around with excitement. And watching the brass spiral around inside the machine...completely hypnotizing. Son #1 has lots of questions - fun to answer and show him how things work. The little kiddos are, of course, more than a little too distracting and grabby to have around when charging cases with powder. But beyond that, if they want to hang out with dad and see what's going on, that's fine by me. Overall, I'm really enjoying reloading. Lots of tangible and intangible benefits, beyond the main point of saving money on ammo. I know many of you have years and decades of reloading under your belt, but if you're debating whether to get invest in the tools and dedicate the time to learning the art and science of reloading, I'd highly recommend it.